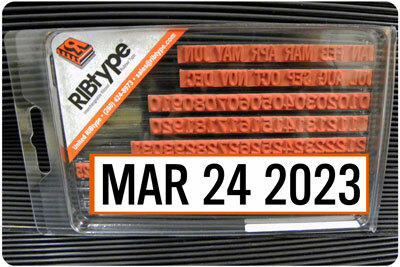 Instead of making up date codes with individual sorts, you can have all the benefits of disposable one-piece date codes including optimum quality, faster changes and less chance of operator set-up errors. Plus, all characters wear evenly as they print because each code is individually molded as one piece. Just remove yesterday's one-piece date and replace it with today's. It's quick and easy. These off-the-shelf date sets contain the basics to begin marking dates on your product and are perfect for printing a MMM DD YYYY date code. Each set contains one each of the months, dates, and six consecutive years. A space is included after each month and before the year to allow for even and consistent spacing.